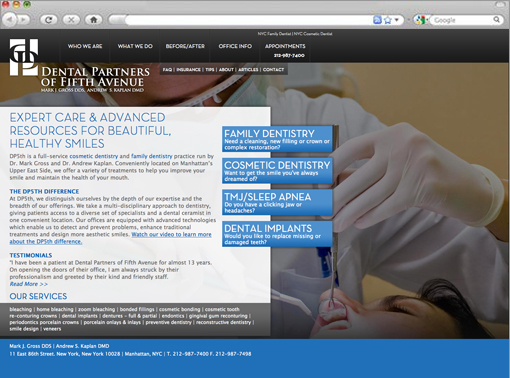 Dental Partners of Fifth Avenue’s original site was a dated Web 1.0 site with many untitled pages and dense copy which necessitated changes beyond a mere update. We produced a thorough comparison of their site with that of their competitors. Our straightforward explanations allowed the client to understand the need for the seemingly basic elements that make for strong design on an increasingly dynamic Web: search engine optimization can provide the traffic, but the web’s scrupulous audience demands engagement through design that stimulates and encourages interaction with the site. Transformed into a highly navigable site, it reveals the practice’s expertise formerly hidden under the clutter of their old design. In its first month the new site received over 180,000 impressions and 1000 page views.